Established W!se and integrated the CEO’s previous initiatives, Quality of Life INNOVATIONS and W!se Institute into the programming. Created our flagship Financial Literacy Certification program for high school students. Built the Library and Technology Center, a state-of-the-art library for the High School of Economics & Finance in New York City. Helped the Delegation of the European Union to the U.S. launch the Euro Challenge and became its national coordinator, now in 15 states. Offered our Financial Literacy Certification program outside New York State; the program is now offered in 48 states. Created MoneyW!SE, designed to serve the personal finance needs of at-risk adults, primarily survivors of domestic violence. Launched a Certification exam for personal finance instructors; this exam is now administered in 35 states. 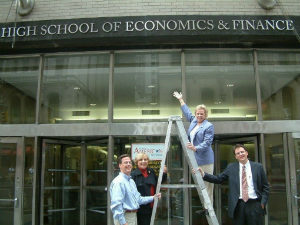 Created the 100 Best W!se High Schools Teaching Personal Finance, the first annual ranking of its type in the country. Created EGE (Engineered Green Economics), a STEM program for high school students to develop their knowledge about economic sustainability. W!se is a national partner of the Jump$tart Coalition for Personal Financial Literacy and, since 2003, we have managed the New York Financial Literacy Coalition, the New York State Jump$tart affiliate. The Coalition’s goal is to promote and advocate for K-12 financial education.